Today is a day when we reflect on the life and legacy of Dr. Martin Luther King, Jr. On this day, I bet most people won’t be thinking about breastfeeding. But I will be. African American women have the highest rates of perinatal maternal and infant mortality in the U.S. – they are more than twice as likely as women in other groups to have complications in pregnancy and childbirth that lead to death. African American babies are born earlier and sicker than other babies. They are also less likely to be breastfed. Around 60% of African American mothers initiated breastfeeding in 2011. That might not seem super low, but it is much lower than mothers in other groups. For example, 81% of non-Hispanic White, 83% of Hispanic, and 90% of non-Hispanic Asian mothers initiated breastfeeding in the same year. Most African American mothers also do not continue breastfeeding as long as mothers in other groups. Fewer mothers starting to breastfeed, and fewer mothers continuing to breastfeed, may contribute to poorer health among African American women and their babies. So, on this day, I wonder what Dr. Martin Luther King, Jr. would have to say about breastfeeding justice. I imagine his mother, Alberta, had grown up seeing women breastfeeding all around her as part of the rhythm of everyday life – not as a spectacle or something anyone would have given a second thought. I imagine that when she gave birth to Michael (MLK’s birth name) at home on that January in 1929, a skilled midwife was at her side. She likely placed baby skin-to-skin to keep him warm. The midwife may have tended a fire in the home for the birth – a warm room would not only make it more comfortable for baby, but would have also helped Alberta recover from birth, bring her body back into balance, and close her womb. The midwife may have massaged Alberta’s belly with oil after birth and even prepared her special tea that would to cleanse her womb and bring her milk in. I imagine that Alberta breastfed her baby boy. I am not a historian. 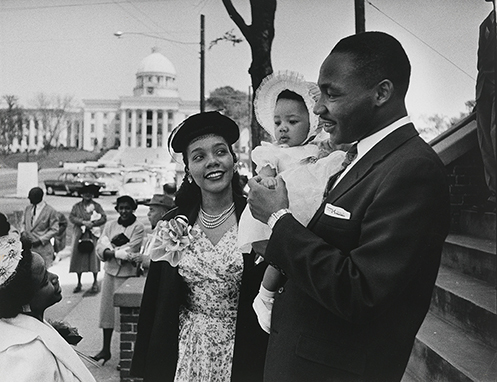 But I do know that Martin Luther King, Jr. was raised during a time in African-American history when there was a rich family culture that nurtured motherhood through midwifery, breastfeeding, and community. It was also a time in which infant formula was not yet widely available, except to those in the medical field and others who were wealthy. 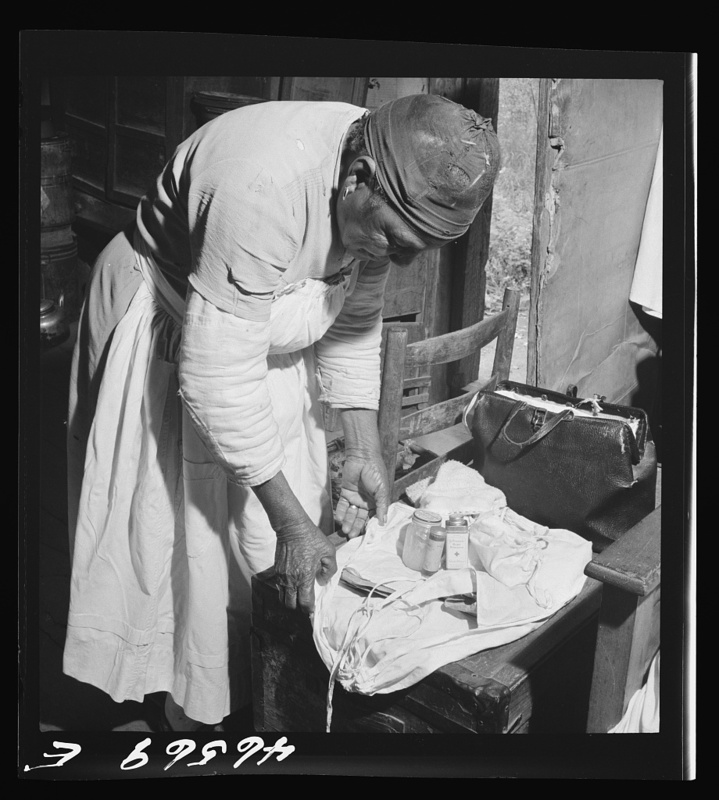 In some of my exploration of the history of infant feeding in the U.S. generally, I stumbled upon this amazing collection of historic photos from 1935-1945. What I found was extraordinary. These photos, released online for the first time just last year, provide a glimpse into the lives of families across the U.S. during a time in which mothers across the nation were giving up breastfeeding in favor of feeding babies with infant formula and bottles. I entered the search terms “mother” and “baby” and put together a selection of images of African-American family life – mothers, babies, young children, grandmothers, midwives. Here’s a photo taken in 1941 of a midwife putting together her kit. These images were taken during a critical time in the history of infant feeding. On the early end of the range would have been a time when most African American babies were still breastfed by their own mothers, and when grandmother-midwives delivered their own grandbabies at home. 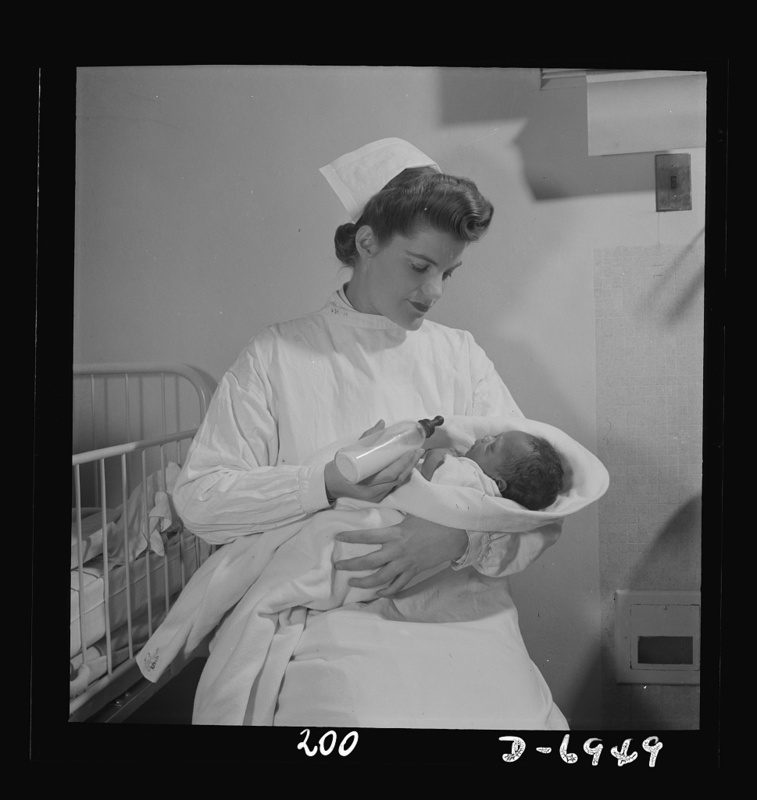 By the later end of the range, there are more images of bottle feeding and hospital based infant care. Here is a nurse teaching a young mother how to clean baby bottles. Bottle feeding allowed women to work longer hours away from their babies, and older children took care of younger siblings while parents worked. And here is a photo of a nurse bottle feeding a newborn in a hospital. 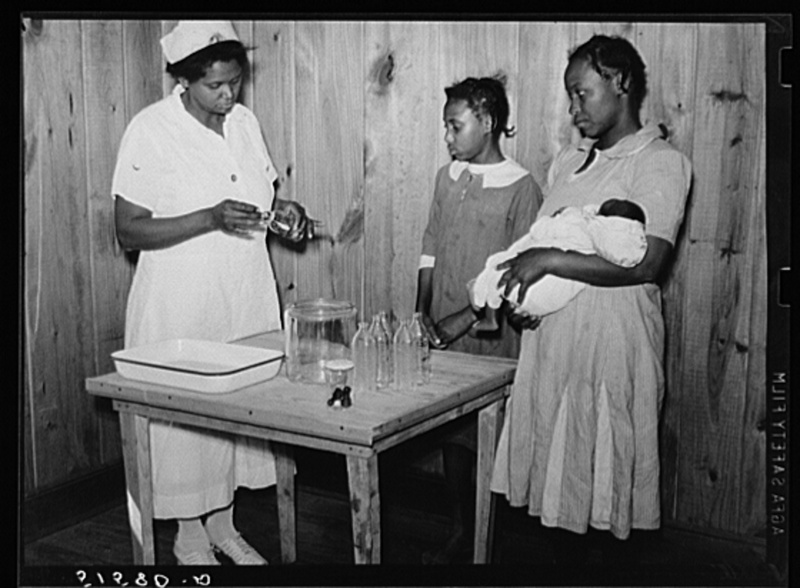 Others, who are far more expert than I, have written extensively about the maternal-child health crisis among African-American women today in the U.S. What I have learned from them is that breastfeeding has been systematically dismantled within African-American communities, through violence, racism, discrimination, poverty, and social, political, and economic oppression of virtually every form. I have also learned that one cannot possibly understand the breastfeeding disparities we see among African-American mothers and babies today without understanding history. 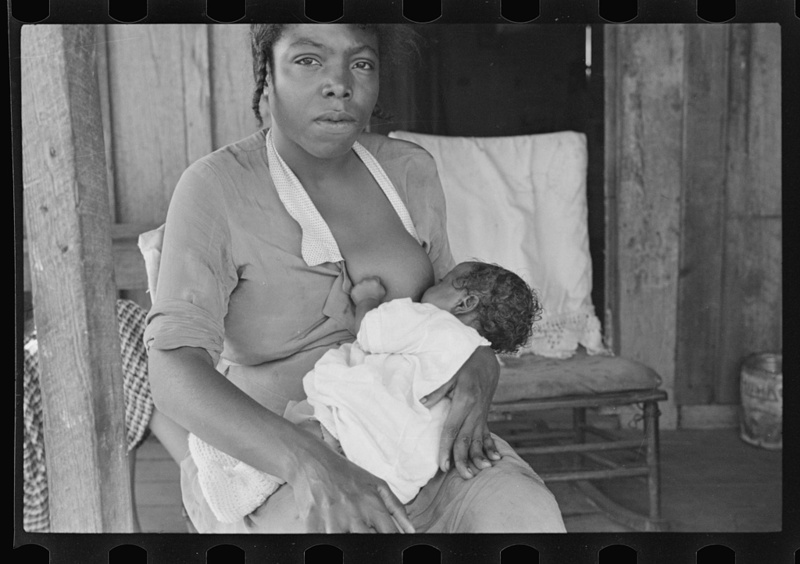 As I reflect on breastfeeding inequalities in the U.S., I think about the legacy of Alberta King and all the women in the historic photos who homebirthed and breastfed their babies. I think about the African-American women today who devote their lives to reclaiming this cultural heritage and working against the exploitation and oppression of mothers and babies in their communities. Dr. King’s legacy continues to shape the fight for health equity within African-American communities. What better day than today to reflect on birth justice and breastfeeding? And here is a nice introduction to understanding disparities in African-American breastfeeding rates, using a social ecological perspective by AnthroDoula. All Photogrammar images in the slideshow are considered public domain. Originals are available through the Library of Congress. All captions and dates have been reproduced verbatim using LOC information. Aunchalee Palmquist, Assistant Professor of Sociology & Anthropology at Elon University. I’m a medical anthropologist and International Board Certified Lactation Consultant (IBCLC). Opinions are my own. I’m also on Twitter!